but recently (on Facebook- I think) Iain, you mentioned working through 9 throws? I'm curious which ones they were, and where they came from (in reference to Funakoshi). By far and away the best translation of Karate-Do Kyohan, and to my knowledge the only one that has the original pictures of Funakoshi himself doing the throws, is the one by Neptune Publications. Just been online as I was going to link to their website, but it is down so perhaps they have now sold out? If you can get a copy it is worth every penny. I hope that helps? there are actually 11 throws that Funakoshi shows in his three books Ryukyu Kempo Karate, Rentan Goshin Tode Jutsu and Karate Do Kyohan. Byobu Daoshi, Katawa Guruma, Koma Nage, Kubi Wa, Saka Zuchi, Tani Otoshi, Tsubame Gaeshi, Ude Wa, Yari Dama. From Ryukyu Kempo Karate is the Ude Daoshi and the Nodo Osae. Funakoshi changed the names of the throws a view times, so be careful with the names. For example in Ryukyu Kempo Karate and Rentan Goshin Tode Jutsu he shows a throw which he refers to as Tani Otoshi. In Karate Do Kyohan the same throw is called Zaka Zuchi and the Tani Otoshi in Karate Do Kyohan is a new throw. So don't get confused. Hope that helps. By the way the translations are sometimes a bit poor. For example Katawa Guruma is often translated as "half wheel" but the kanji used for katawa actually mean "cripple". Interesting he shows throws/ grappling with the other teqniques and I also find it quite interesting how short and high his stances are in this book compared to the shotokan that I was taught! Hey Iain, I bet they have sold out, I bought a copy in February and they only had four left. Great book, thanks for the recommendation and link. You did well to get one. It is a great book and I knew their was a limited run. One of my students got one last year and he was told numbers were dwindling then. Good to know they are out of stock so I can avoid recommending it to people just to disappoint them. Just had a quick look at the Rentan pdf from the Hawaiian Uni site. And this might be better on a separate thread - but it's funny how un-"shotokan" Funakoshi looks. By modern standards of course. 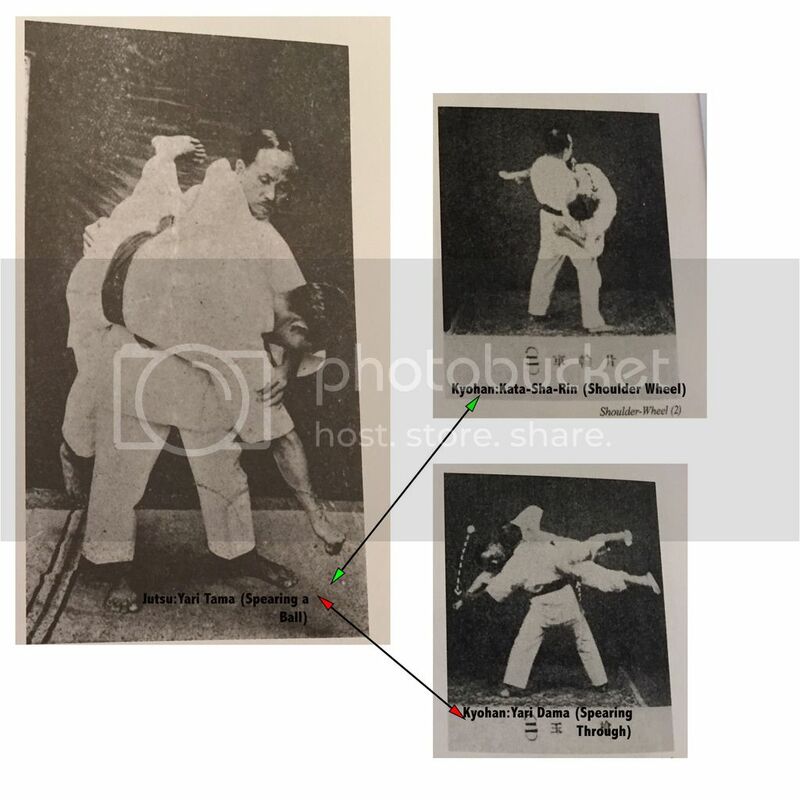 Plus, his punch and kick angles in the pics suggest he was delivering techniques off his centre line, or at least off the embusen line slightly - error in photography or was that the way it was done then? Thanks for all the help lads. Too bad about that Neptune publication sold out! aargh. Holger that is a great resource of which I was previously unaware. Thanks for sharing! Jon, in some Okinawan styles, the kihon is still as it is shown in the book. Techniques are commonly executed to the front, in line with the shoulder or hip and not to the center of the body. Maybe what we often see as modern Shotokan is just representative of the growth of the style to this point? This suggests that Funakoshi was still developing his art when the pictures were taken. We certainly deploy our technique in line with our hip rather than the centre line. It is central to our change body/off line strategy. We also beleive it is structurally sounder than working in line with our own centre or indeed shoulder. What is amazing is that, once you've seen these throws, it really helps to find the applications of some moves of some katas that otherwise are very difficult to understand ! Thanks very much for this !! You're right though, I can see bits of Kata straight away in these. There's so much in the kata, why was it never taught until the 3rd and 4th Generation Shihans are coming through and are Asking the questions of the what why when and how? No. 4 Katawa Gurma - Cripple wheel - I think I can see it in Kanku Dai, but I wanted to know if it was shown in others. No.6 Yari Dama - Spearing Through. The videos above have helped a lot with the way they do them, I am also presenting them in a more relaity based form too. Which brings us to the two you actually asked about! Personally, I have differing primary bunkai for that sequence (https://youtu.be/KleSZKUyJBs) but I know lots of Shotokan guys who make the connection with Katawa Gurma and that sequence in Kanku-Dai. Or are you thinking of another part of the kata? I really dislike that “throw”. I can’t see it working against anyone but the most compliant of ukes. I’ve also checked it with elite throwers and judo coaches, in case I was missing something, and they concur that it is a very odd throw that stands little chance of working as presented. As an aside, most of the Judoka I’ve shown it to think that the head needs to be on the other side for it to work (such that it is a modified Kata-Guruma preceded by a groin strike “to dampen his vigour”; as Funakoshi put it). The judo throw appears here: https://youtu.be/hBSJoGYmEko That throw can be found in Enpi, but I don’t see Yari Dama (as is) appearing in any kata that I’m familiar with. 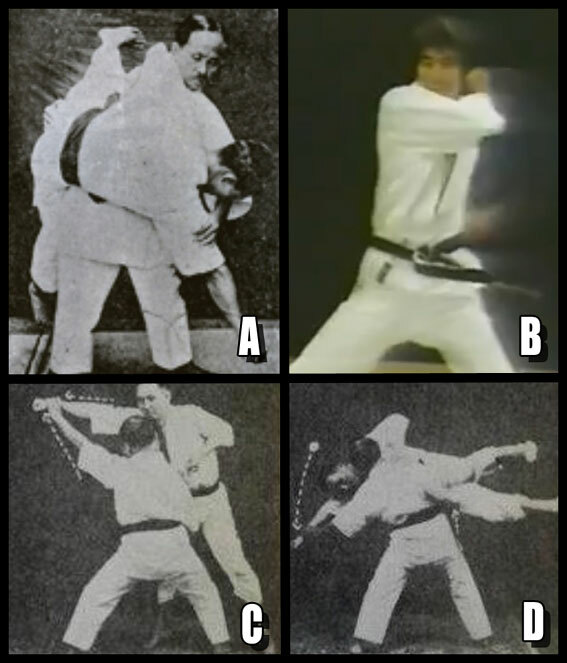 Option 1: In the two pictures (and small amount of text) in which Funakoshi shows the technique in Kyohan, some vital element is left unclear. We are therefore trying to apply a technique in a way that was not intended. In the video in the above post we can see Yaridama performed exactly as it appears in Kyohan (https://youtu.be/Ndz_71vTsiU?t=1m44s), but there is no way that would actually work. In Karate Jutsu, Funakoshi also shows another throw also called “Yaridama” (in this case translated as “spearing a ball”) which is a much more practical throw. The techniques in Kyohan and Karate-Jutsu are written with the same kanji, and they have some similarity in name and description, so maybe the throw in Kyohan is just badly explained and photographed i.e. it comes across better in the Karate-Jutsu book? If that is the case, then the throw is workable and, if you were to turn into it, we could find it at the end of Heian Sandan (see photo below – as the throw was completed the hand on the enemy’s arm would come to the hip, and the hand between the legs would come over the shoulder). All of that said, the “Yaridama of Jutsu” and the “Yaridama of Kyohan” could have been entirely different throws to Funakoshi, just as the “Taniotoshi of Jutsu” and the “Taniotoshi of kyohan” are entirely different throws (which are also both different from the Taniotoshi of Judo). Option 2: Funakoshi has presented a totally unworkable technique. This is possible as other throws in the set are questionable with regards to their direct function. Tsubame Gaeshi is too fiddly to work against a non-compliant enemy. Gyaku Tsuchi requires a huge amount of strength … and Funakoshi contradicts himself about this in the two books in which he shows the technique. In Karate Jutsu – where Gyaku Tsuchi (“upside down hammer”) goes by the name of “Tani Otoshi” (“push off a cliff”) – he writes of it, “when one is much stronger than the opponent, the technique can be executed smoothly and with ease. But when facing an opponent of equal or larger size, there are times where the technique just will not work …” However, in Karate-Do Kyohan, Funakoshi tells us not to drop the enemy on their head unless they “extraordinarily powerful”. You can’t have it both ways i.e. you need to be stronger then the enemy to get the first part of the technique to work, but don’t do the second part unless the enemy is stronger than you?!? So maybe, with regards to Yaridama, he just wanted to include something “Akido-ish” (i.e. light touch redirection) and the resulting effort (Yaridama as shown in Kyohan) was not a good one? That’s possible. However, Funakoshi makes a good job of all the other throws – even questionable ones in terms of realism – whereas this one stands out as being poor on all fronts. I’m therefore more inclined to lean toward faults with presentation as opposed to intended content. Option 3: The throws is fine, but because I’ve not learnt it first-hand from Funakoshi – and it’s always hard to convey the nuances in photos and text – I’m doing it wrong. The others I do OK, because I have experience of those methods and hence I’m taking the nuances of the technique as a given; whereas I’m missing them on the unfamiliar technique of Yaridama? We humans have a habit of labelling things “impossible” or “impractical” when in truth what we should be saying is “I can’t do it”. So maybe it’s me. However, the fact I’ve also shown the throw to expert throwers and coaches, and they don’t get it either, leads me back to thinking there is indeed a fault in presentation or content. The description is Karate-Jutsu is as follows, “As the opponent comes into punch your face with his right hand, use the left had to block from the inside then use his right arm but grabbing it while simultaneously inserting the right hand between his legs to lift and throw him over.” If we turn on the right foot, such that the left leg goes behind, as we pull on the enemy’s right arm, then the motion of the feet and arms will match Heian Sandan perfectly. Just a few thoughts on where Koma Nage may appear in Kata. This motion, I believe fits the Koma Nage (armbar and rotating takedown) technique. As Iain mentioned, Funakoshi notes this is the application found in Tekki/Naihanchi, and the same motion is seen in the Heians/Pinans and Kanku Dai/Kushanku. I feel a standard armbar followed by a strike would be the most effective application and therefore found more predominately in Kata. However, with this throws inclusion in the "sho" version, I think it adds to the thoery that the "sho" kata show alternate methods that complement the more primary methods of the "dai" kata. I'd be interested to hear if anyone else sees this comparison or have found that it fits other motions too? I find that the primary difference between Funakoshi's two examples of yaridama is the range. In Karate-Jutsu, he is gripping much closer to the shoulder and, therefore, puts himself closer to the opponent's core, where he can more efficiently affect balance. In Kyohan, he grips at the wrist, which automatically moves him to a much less effective position in relation to his opponent. For what it's worth, Itoman Morinobu shows a very similar throw (which he calls ippon ude kata-nage, or "single arm shoulder throw"), and he does it at the closer range seen in Funakoshi's Karate-Jutsu. Since Itoman's book is mean to show, according to him, basic techniques of Toudi, I think we can say this is the way the technique is intended to be done. The Kyohan version, as Iain suggests, may well be a modification done to make it more Aikido-like, after having spent another decade on mainland Japan, or it could simply be that the photographer said "Hey, I can't see what you're doing, there! Make more space so I can see!" I find that the primary difference between Funakoshi's two examples of yaridama is the range … The Kyohan version, as Iain suggests, may well be a modification done to make it more Aikido-like, after having spent another decade on mainland Japan, or it could simply be that the photographer said "Hey, I can't see what you're doing, there! Make more space so I can see!" The need to “open things up” for the step by step photos is possible. If that was the case, the trouble is that the resulting throw (as presented) has numerous problems. In Karate-Jutsu, he is gripping much closer to the shoulder and, therefore, puts himself closer to the opponent's core, where he can more efficiently affect balance. In Kyohan, he grips at the wrist, which automatically moves him to a much less effective position in relation to his opponent. Absolutely! The hips are also a key part of the “Jutsu version” whereas they seem left out in the “Kyohan version”. The issue I had was the pictures and the interpretation of them. I just could not see where yari dama was. I can work with it as shown in the kyohan with my son but it was unrealistic. Now that I have seen the picture and description from the jutsu book it makes more sense. Looks like I will have to go and get myself a copy of this book!!!! Thanks so much for the help. I think we can all agree that the Yaridama in Kyhon is not workable, but as Iain pointed out the Yaritama that is shown in Jutsu is far more functional. Now if we go back to Kyhon we see a throw that did not appear in Jutsu, Kata-Sha-Rin (Shoulder Wheel). Take a look at the pictures. Yari Tama (Jutsu) looks WAY more like Shoulder Wheel (Kyhon) than it does Yari Dama (Kyhon). I think that may be a confusing way to word it but the point is. It is a case, like Taniotoshi, where he is changing the names around on us but doing the same throw. That's a good observation! The photos really help when put side to side like that too. There are definitely some commonalities, but they are different throws I think i.e. the grip is different and so is the entrance. When you read the associated descriptions the difference become more pronounced. That said, they both involve griping and lifting the leg while the upper half (by the arm on one and neck on the other) is pulled downward. Maybe, when putting Kyohan together Funakoshi decided to avoid such commonalties and that contributed to Yaridama being done in a straight line, seeing as there is the rotational throw of katawagaruma (transliterated as “katasharin” in the Neptune Publications version of the book)? If you can get a copy it is worth every penny. I hope that helps? Speaking of which I was looking on Amazon for some stuff and found Bunkai Jutsu new copies are going for a minimum of $170 and used ones $110. Fair enough. I guess what it boils down to is that he was teaching different expressions of very similar principles. I wonder how much of the confusion that comes from these throws can be traced back to a language barrier. Even with the Neptune version of Kyhon I could see something potentially getting lost in translation. Yeah I believe that it is out of print. My copy is borrowed from one of my teachers and he was shocked when I told him how much it was worth. I bought my Neptune copy of Kyhon last year directly from the publisher and he only had a few copies left. I just checked and I'm having trouble even finding this copy online anymore. Amazon has two hard cover versions going for $250+. The only reason to get Jutsu IMO would to be to compare to two texts for minor detail shift. Personally I think the fact that katawa guruma is not in the original toudi jutsu book but bears a close resemblance to the yaridama from it is telling. Clearly Funakoshi is not working with a time honoured set of throwing nomenclature that is widely understood and is chopping and changing his names just to sound good and present an image of karate as a unique and distinct practice in its own right. Such a coherent system of names did exist in the mainland Japanese martial arts world (and became the basis for judo terms) and I seriously doubt that Funakoshi would have not had some exposure to it. If an older set of Okinawan terminology did exist then it would almost certianly have been uninteligible to mainland Japanese and be no use in promulgating the art there so I can understand why Funakoshi may have avoided that. 1. Neji taoshi (possibly neji daoshi), lit: "twisting takedown" for what is called "koma nage" in Kyohan. 2. Kusariwa, lit: "chain ring" for what is called "udewa" in Kyohan. 3. Tani otoshi, lit: "valley drop" for what is called "sakazuchi" in Kyohan. 4. The aforementioned "yaridama" which seems to have become "katawa guruma"
5. "Kubiwa", which is the same in both name and form in both books. 6. "Nodo osae", lit: "throat press" that does not seem to have any equivalent in Kyohan. It must also be said that the descriptions in toudi jutsu are horribly vague and each throw is only shown in one picture, making it very hard to pick up on any details at all. The final one, "nodo osae" for example shows Funakoshi gripping the opponent's ankle at his own waist while squeezing his throat with the other hand but the description makes no mention of taking the leg anywhere. The overall style and language of the earlier book feels much more archaic too and the language in Kyohan may well have been updated and modernized by an editor where toudi jutsu is Funakoshi's unaltered writing style. Clearly Funakoshi is not working with a time honoured set of throwing nomenclature that is widely understood and is chopping and changing his names just to sound good and present an image of karate as a unique and distinct practice in its own right. That’s my suspicion too. Funakoshi seems to be simultaneously wishing to be like judo (the “do” suffix, the white gi, the ranking via belts, etc.) whilst also retaining karate’s uniqueness. Adopting the common “judo names” for the throws may have been thought a step too far? Funakoshi was great at coming up with names for things though! While I don’t personally use his names for the throws, or his names for the kata (not being Shotokan), I do like the poetic / descriptive nature of them. My personal favourite is the one of the ones that never caught one: “Hotaku” (woodpecker) as an alternate name for Gojushiho. That fits the kata so well! 1 – Tori and Uke begin with their right foot forward (“in a reverse position”) as opposed to the more common left to left. 2 – Uke throws a lead right jab, which is blocked by Tori’s lead right hand (“use the right hand to block the opponent’s attacking right hand”). 3 – Tori then continues to move his hands in a mawashi uke / “wax-on wax-off” fashion such that the left hand ends up in contact with uke’s punching arm. Tori’s now free right arm goes forward and pushes into uke’s throat (“immediately replace the right hand with the left while sliding the right hand up to grab his throat”). 4 – This is where Funakoshi has nothing to say, but filling in the gaps … the push to the throat drives the head backward such the uke’s weight will shift towards their back leg. Tori’s left arm – which was in contact with the initial punch – then drops down to catch the lead ankle as uke’s weight transfers off it. 5 – Once the ankle is lifted, as shown in the picture, we can then twist to “throw him down”. That would be my guess as to the entry based on what Funakoshi describes and the associated photo. The actual throw itself could be accessed in lots of ways of course, including simply catching a kick. Makes sense to me. Having worked with editors for books I know how good they can be at polishing. As a Japanese speaker, have you read Toudi Jutsu in Japanese? I ask simply because I’d like to know if the writing style is present before translation, or if the methods of translation has had an influence i.e. was the older book translated in such a way as to give an “older feel”? I have read the Japanese version of Toudi Jutsu yes, although I have not read any of the English translations in full. From what I can tell there was no special effort made to give Funakoshi's style a more archaic feel. That is probably for the best as many modern day Japanese readers without experience of the older style would struggle with the original text now (It was hard going in places for me) and I can't really see much benefit in reproducing that effect for an English readership other than as a historical curiosity. There is also the problem of what period's English you turn it into. The evolution and levels of standardization and revison across languages by no means run in parallell and so just using the language of the same year the original was published would fail to capture the same feel of linguistic seperation that the modern Japanese reader would experience. The Japanese language underwent massive standardization and modernization programmes over the early 20th century, causing significant changes even across a decade or two (e.g. between Toudi Jutsu and Kyohan). There was also further revison after WW2. Compared to this, the English language has been comparatively stable and relatively unchanged fopr the last 150 years or so. Another thing I noticed was that in the Japanese version of Kyohan the ostensibly unworkable version of yaridama includes a step simultaneous to lifting the leg where you pull the grabbed punching hand back past your waist and twist. This does not appear to be shown in the photos and may be a hint at how the throw is "supposed to work". I was wondering if the same instruction was somehow missed out of the translation? Thanks Gavin! That’s very useful.